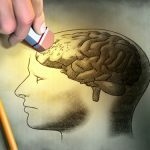 Memory loss is the inability to recall previously-learned information or to process recently-learned information and is the most common psychological manifestation of the normal aging process. Memory loss is not, however, the same condition as simple forgetfulness. In the medical professions, “pathological” memory loss is defined as “amnesia” and is usually considered to be one of either two general types: retrograde amnesia or anterograde amnesia. Retrograde amnesia refers to the inability to recall information about events that occurred in one’s past, such as the details of childhood events or data that was previously recallable from memory “on demand.” As a general rule, those with retrograde amnesia will be able to form memories of more recent events but will not be able to recall many past events. On the other hand, those with anterograde amnesia will have relatively little difficulty with recalling information of past events but will have problems storing and retrieving more recent data. In practical terms, “pure” retrograde or anterograde amnesia is rare and memory loss usually involves features of both conditions. The actual processes by which memory is obtained, and then later recalled, is still poorly understood. In broad terms, any disease process that disrupts or impairs the normal function of the brain’s nerve cells such as such as trauma, stroke, or brain infection, is capable of producing either temporary or permanent amnesia. As examples, the intemperate use of alcohol can lead to a “blackout” period from which the drinker can recall nothing or a person with head trauma may be unable to recall what happened immediately before and after a motorcycle accident. However, the process that is most commonly associated with memory loss is aging. Age-related memory loss, sometimes called “senile dementia,” can be associated with a number of disease processes such as hypertension, diabetes, stroke, or even Parkinson’s and/or Alzheimer’s diseases. Regardless of the underlying causes, given the fact that the members of society as a whole are living longer, there has been considerable interest in any therapies that may slow down or even prevent such memory loss. Since many prescription medications that deal with memory impairment have undesirable side effects, the remainder of this article will review several natural agents that may show promise in memory issues involving older individuals. Fatty acids are an essential component of the membranes surrounding all the body’s cells, including those of the brain. It has been long-known that ethnic groups whose traditional diets include several servings of fish per week have fewer problems with age-related health issues, including memory loss. The fatty acids of the Omega-3 family (“fish oil”) have been demonstrated to be effective in restoring the integrity of cell membranes that have been damaged by a number of disease processes commonly associated. As an additional benefit, Omega-3s are known to help maintain healthy levels of cholesterol and thus help reduce the severity of atherosclerosis (“hardening of the arteries”). Vitamin E has both anti-oxidant and anti-inflammatory properties and both properties are known to improve cellular health. However, recent medical studies have suggested that the family of vitamin E known as the tocotrienols may possess even better benefits than the more commercially-available vitamin E products. In fact, some studies have suggested that the tocotrienols may slow the progression of some forms of age-related memory loss. Vitamin and mineral deficiencies, particularly of the B-complex vitamins and the minerals zinc and magnesium, are known to adversely affect memory and other vital nerve and brain functions. A growing body of evidence suggests that such deficiencies may be far more common that previously thought. Tryptophan and tyrosine are amino acids that are the precursors (“building blocks”) of several vital brain chemicals, low level of which may be associated with memory disorders, depression, and disorders such as Parkinson’s Disease. Intensive medical research into the potential value of dietary supplements in this diseases is ongoing at this time. In summary, this article has described memory loss as an important issue in public health and as an area of extensive medical research and has further presented a brief introduction to several nutritional supplements that may be of value in treating this condition.